As part of our family room makeover I decided to move out our two end tables. While I liked the furniture it was just too big for the space. One side came up too close to the fireplace and the other didn't seem to fill the space enough. I felt like a round table in the corner would be better. I had one sitting downstairs unused so I brought it up. For the tablecloth I wanted something neutral but with texture...and of course I am always looking for budget friendly so burlap came to mind. I tried it out and while it works for now, it honestly is not my favorite. Maybe a little too shabby chic for the space??? But if it works for your space and you want to see how I created it, here is the tutorial below. To be honest, there are probably much better ways to do this...I just took off with the idea and had to make this work with the width of burlap I purchased. 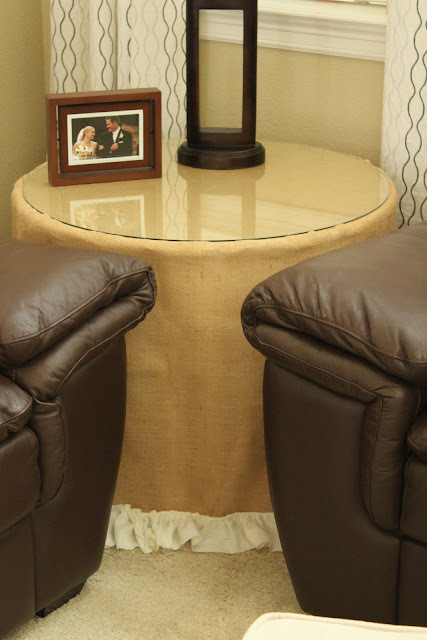 If I did it again, I would probably try to buy wide enough burlap to eliminate the need for a seam around the top. First, I flipped the table over on top of the burlap and traced around the top edge. I then cut out the circle from the burlap slightly bigger than the tracing line to allow for a seam. Next, I took the remaining burlap and pinned it to the circle top around the top edge. I did this while it was on the table to make sure it was long enough. I pinned all the way around the circle...and had to make up for not having enough fabric by piecing together a section in the back...by the way, I do not recommend this :) Be smart and buy enough fabric. Once I had it all pinned, I stitched the two pieces together. I used a zig zag stitch because I had read that is the better way to sew the burlap pieces and insure they stay together. Then I turned it right side out, tried it on my table and it was too short. When I pinned the pieces together, I had do what I could to make it work and unfortunately this meant sacrificing the length a tad. So I dug through my fabric stash and used some light linen type material to create a ruffle for the bottom. I cut several strips 4 inches wide and pieced them together until I had enough to go around my table. I ruffled the linen fabric using my serger (I am really starting to love how easy ruffling is on that machine!). Then I attached the ruffle on the exterior of the fabric at the height I wanted to have the ruffles touch the floor. I pinned it on and then used a straight stitch to attach it. The tablecloth is pretty sheer by itself so I took a white table cloth I already owned and put it on underneath the burlap one. Hi there, new reader, saw your living room makeover on i heart naptime and was browsing around. I LOVE this tablecloth! It is exaclty what I am looking for, I have the same round table in my living room and want something exactly like this. Unfortunately, I do not know how to sew. If you decide you don't want to keep it, I would gladly buy it from you! 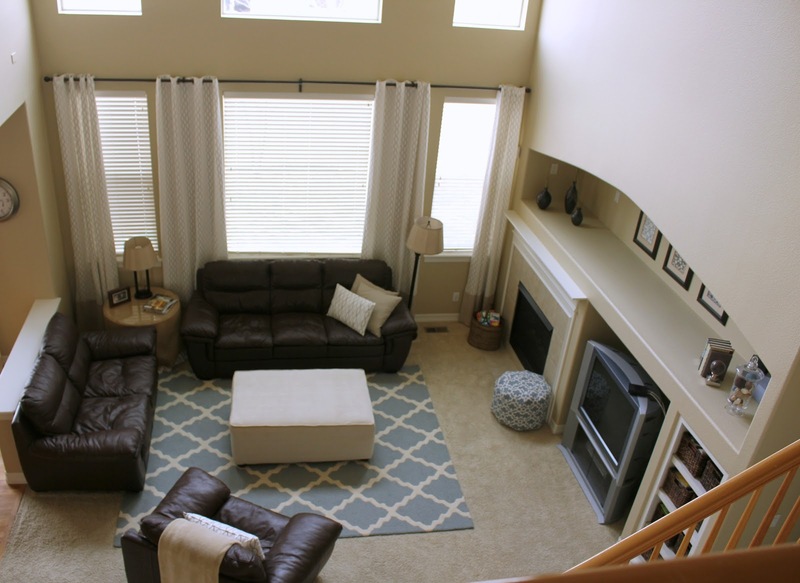 Great job on the living room also!